It’s no secret that children love playing with water and when given the chance, they can devote hours engrossed in water play. Splashing and spraying, creating mighty, magical waves, guiding the stream, changing the flow, pouring it back and forth, and observing liquid spill over a vessel. 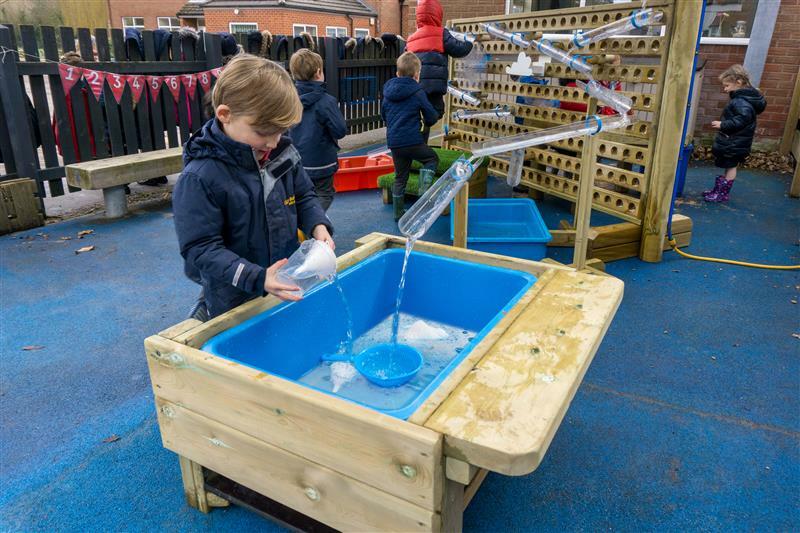 Water play is an essential part of a STEAM playground: not only is it heaps of fun, but it shapes the groundwork for understanding many scientific notions in childhood. Science surrounds us and water play inspires children to discover and learn through play. 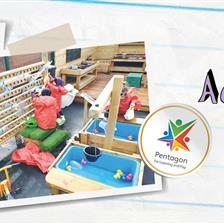 Sink and float notions are commonly part of the Early Years and Key Stage 1 curriculum. 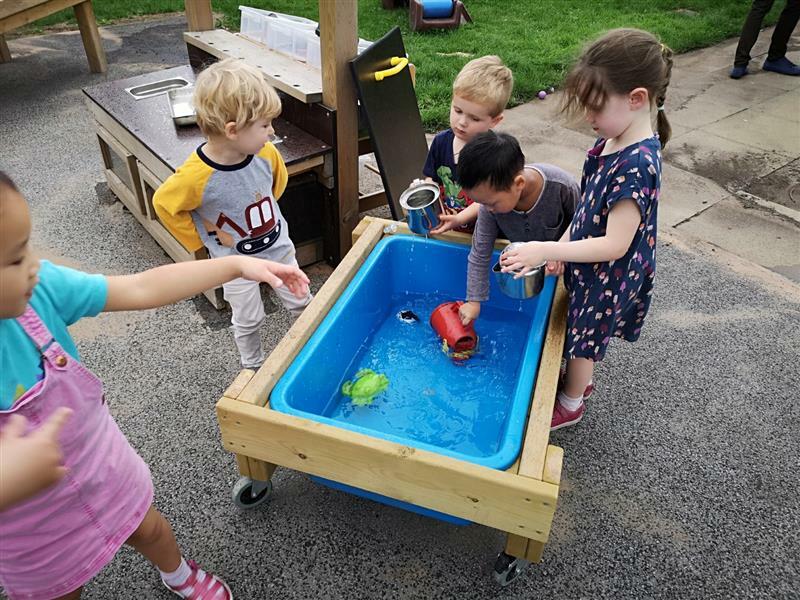 The addition of a Water Table in the outdoor play area allows children to investigate and explore which objects float in water and which ones sink. Teachers can support and extend learning by adding a combination of objects such as feathers, balls, pebbles and vegetables, for example, a lima bean and small pumpkin. This then leads to infants wanting to understand why some objects float and others sink. Why did the pumpkin float and the lima bean sink? Another important question raised by using the water table is whether porous items sink or float. The water table endorses observing, predicting, discussion with peers and rationalising. 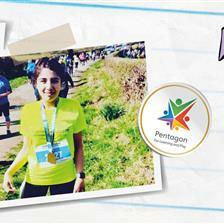 It aids children to question further and learn through examination. Watching water flow is captivating for little ones. 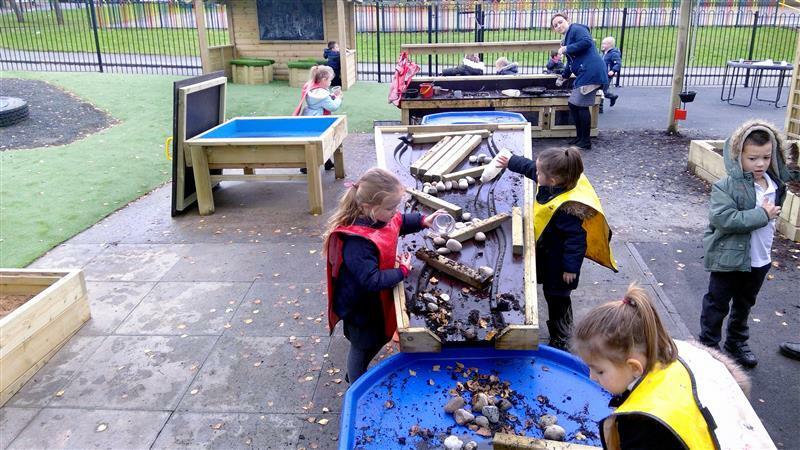 Our fantastic Water Wall and Damming Play Environment have been designed and created to provide children with the opportunity to understand how water flow works and how to stop it by creating dams. It teaches children how to problem-solve by working in a group, communicate with each other to discuss ideas and actively learn through exploration. Pearlescent, delicate little balls that pop at the slightest touch! By adding washing up liquid to the water table, children can watch bubbles form. This bubble-fun activity endorses scientific thinking through observation. Eventually, children will question why bubbles form and why we can't catch them? Although young children might not understand the exact science behind bubble formation, by studying them through play, they can improve their learning and evoke interest during class. 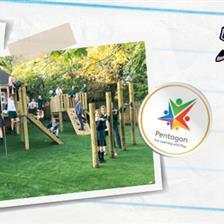 Our fascinating Gravity Table can be used to show children a visual demonstration of cohesion and adhesion in action. Cohesion happens when molecules stick to each other, as water is attracted to water. By first watching water poured down the PETG sheets, children can see water binding to water in the collecting tray. Adhesion, on the other hand, is when water is attracted to other substances. A fun way for children to see this is by first smearing food colouring to the PETG sheets and then pouring water down the gravity table and watching it bind to the food dye in the collecting tray. A range of materials can be used such as olive oil, sand and salt to see which materials are adhesive (bind to water) and which aren’t. 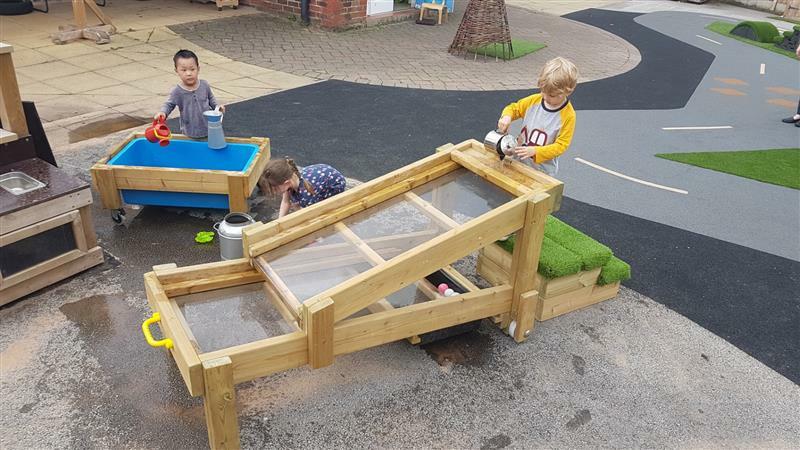 Not only are these activities stimulating and thought-provoking, but the gravity table is also exciting and encourages children to actively explore the properties of water with their peers. Water is the basis of life and, as such, brings virtually limitless learning. Our enchanting Planters found in the charming wildlife area are a delightful way for children to learn about life and the basics of photosynthesis in action. They can get hands on and plant seeds, water them and see their transition into wonderful plants. 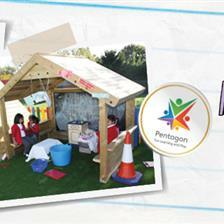 The mesmerising Bug Hotel helps children to generate the perfect environment for creepy crawlies to live comfortably. By inspiring children to fill a pod with bark, twigs, dry and damp grass, children can watch their beloved bugs thrive in their luxury accommodation. They can extend their learning by comparing the bugs in each other’s hotels and discuss which materials they might prefer in their environment. Children can learn lots about measurement through water play. By adding a variety of containers, with different shapes and sizes to the water table, children can compare volume. They can observe which container fills up the fastest and which shape and size holds the most water. They can also learn about fractions by familiarising them with terms such as full, empty, half and less. Weighing Scales can help children to learn about density and volume, for instance, a bucket of sand may not necessarily occupy the same amount of space and weigh the same as water. Children may not fully understand density and volume, but seeing a visual demonstration can move them towards better comprehension. It also helps children to make graphic comparisons between materials. Water play is an integral part of a STEAM playground. Not only is playing with Water Play Equipment thought-provoking and entrancing, it helps children to further their understanding of the world through play. 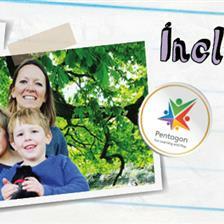 It also delivers opportunities for children to investigate how things work and where they came from. 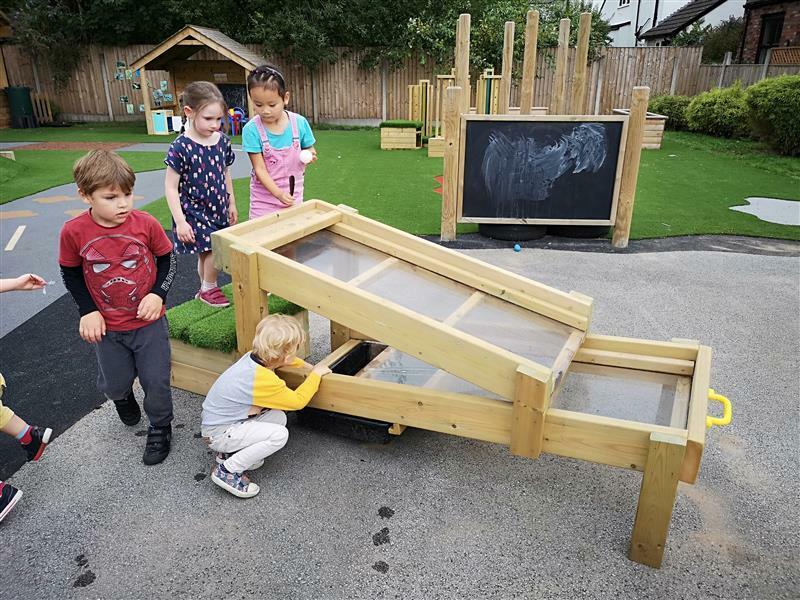 If you would like to find out how we can help you to improve your school or nursery playground to support STEAM learning, please do not hesitate to Contact Us and arrange a free consultation with one of our experts.